James J. Caterino : Run Caitlin Run! The following is an excerpt from the novel "Caitlin Star and the Rise of the Barbarians" Caitlin Star book 3 by James J. Caterino. Caitlin felt sick inside hearing the screams and the cries from below as the creatures of the jungle fled in terror from the raging firebombs. Homes were being destroyed. Life was being extinguished. Entire cultures and maybe even wholesale species could be lost forever; all because a former U.S. Senator fancied himself the conduit of an invisible man in the sky. Cross was not hard to figure out. He wanted subjects to impose his will on. Subjects to worship his perverted version of God, and by default Cross himself, since only he could speak for God. His philosophy was clear and defined; get greedy, take from anyone and everyone and especially from the earth itself, and leave an endless trail of dead bodies, burned lives, charred souls, and toxic waste by the truckload. The former cruise ship turned death ship continued to launch a barrage of fireballs into the jungle as it chugged up the Congo. It had to be stopped now. If that ship crossed through the next channel and continued bombing, they would be on the other side of the rift. With no more natural barriers to contain the raging flames—the entire Triangle could burn into a wasteland and the fires would burn for months from coast to coast. Paradise would be lost. With the rain forest gone and one of the few remaining habitable zones turned into a wasteland. With nothing left to oxygenate the already depleted atmosphere, life itself in post-apocalyptic earth could be over. The planet would become nothing but a barren, inhospitable rock. Earth would become another Mars. She tapped the radio earpiece and microphone Lori had made for her. “What is the exact location of the ship?” Lori asked. Caitlin looked into her binoculars and focused in on the ship of doom. “Coming around the island split via the eastern channel side. The one further away from me,” Caitlin said. There was a beat of silence as Caitlin heard her furiously tapping a keyboard. Before she locked into the mission Caitlin had to ask her the nagging anxiety bothering her. “Any sign of Gunner yet?” Caitlin asked. “I know,” Caitlin said, more out of an auto response than actually believing it. Caitlin knew—as Gunner himself had taught her—she had to focus only on what she could control. Her mentor’s fate and the idiosyncrasies of temporal quantum mechanics were out of her hands. But what was in her hands was the fate of this death ship driving up the Congo and spewing out destruction. And what would soon be in her hands—was Cross’s scrawny neck when she snapped it. She really hoped that he was not on board. Going down with that wicked ship was far too easy of a death for such an agent of evil. Another beat of silence passed. “I got it,” Caitlin said. “Just be my eyes in the sky. You call the plays. I execute them. Just like the old days. “Oracle and the Black Canary,” Lori said. “In about four minutes and twenty-two seconds,” Lori said. “Let me know when we hit thirty seconds,” Caitlin said. Caitlin took the next four minutes to empty her mind, stretch out muscles, focus every fiber of her being, and engage in the transformative visualization technique she had been mastering since she turned thirteen years-old and was rescued by a vigilante anti-hero named Gunner Star. “Thirty second countdown begins right…now,” Lori announced in her earpiece. It was now time for operation Deathstar. Caitlin secured her very best javelin-style throwing spear, doused the tip in the concentrated explosive goo Lori and Lithgow had conjured up for her. Then she crouched down into a sprinter’s stance, and waited for Lori’s start command. 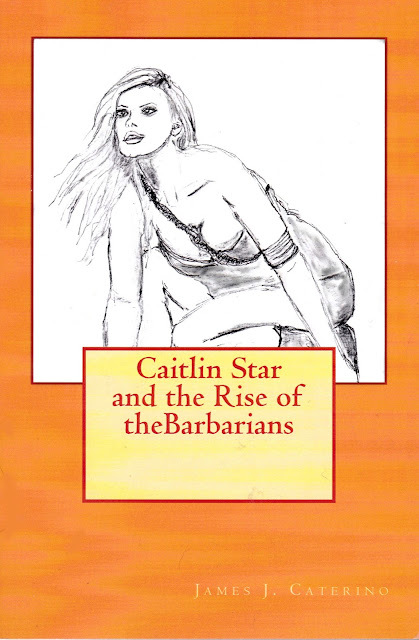 Read more in the dramatic, action-packed Caitlin Star and the Rise of the Barbarians.